For a little Polish girl out of Wyandotte, Michigan, Romatowski has traveled the world during her outstanding athletic career as a player and coach in three sports – softball, baseball and field hockey. While in high school she played on the top fast-pitch softball teams in the Detroit area and then signed with the All-American Girls Professional Baseball League in 1946. She played in the league for nine years until it folded after the 1954 season. Romatowski was named the league’s all-star catcher and led the Kalamazoo Lassies to the AAGPBL championship. The right-handed hitter had a .258 batting average that year with a career high six homeruns. She also saw action at third base and in the outfield. Romatowski later graduated from Eastern Michigan with a degree in physical education and then taught for 28 years. A natural athlete, she then took up the sport of field hockey and a few years later earned a spot on the United States National team and was chosen to play on an All-Star team that toured Europe several times in the late 1950s and early 1960s. Romatowski was later active as a coach and administrator, rising to first vice president of the U.S. Field Hockey Association. Her most recent endeavor has been breeding and racing greyhound dogs in Florida. For a little Polish girl out of Wyandotte, Michigan, Jenny Romatowski has traveled the world during her outstanding athletic career as a player and coach in three sports – softball, baseball and field hockey. A special part of “Romey’s” colorful life was featured in the 1992 Hollywood production of A League of Their Own, which told the story of the All-American Girls Professional Baseball League. The film starred Geena Davis, Tom Hanks and Madonna, and it was a box office smash. In fact, Romatowski is in the movie, which begins and ends with an actual reunion of former AAGPBL players at the Baseball Hall of Fame in Cooperstown, New York. A special exhibit of “Women in Baseball” was unveiled and the entire league was voted in as a special member of the Hall of Fame. Romatowski caught the attention of baseball scouts when she starred in several top-notch fast-pitch leagues. She turned pro after graduating from Wyandotte High in 1946. The league originally began with four teams and expanded over the years. Its popularity grew and the league drew more than one million fans in 1947. That year Havana, Cuba, hosted spring training for the entire league. The young women from the north received as much publicity as the Brooklyn Dodgers, who were also training in Havana. 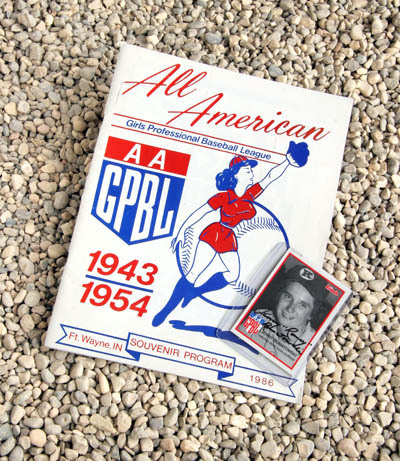 Romey played her last four years with the Kalamazoo Lassies and topped off her nine-year career in the AAGPBL by being named the league’s All-Star catcher. The Lassies also won the very last championship as the league folded at the end of the season. She batted for a .258 average that year with a career-high six homeruns. Besides catching, the right-handed hitter and thrower also saw action at third base and in the outfield. A major benefit of Romatowski baseball days was they paid for her college education. She graduated from Eastern Michigan with a degree in physical education and then taught for 28 years in the Van Dyke-Warren Schools in suburban Detroit. While teaching school, Romatowski became interested in field hockey and took on a new athletic career. A natural athlete, she earned a spot on the United States National team a few years later and was chosen to play on an All-Star team that toured Europe in the late 1950s and early 1960s. Romatowski was later active as a coach and an administrator, rising to first vice president of the U.S. Field Hockey Association in 1967 and again in 1970. She was a member of the rules committee for many years and edited the Field Hockey Guide. “I think field hockey, more than baseball, gave us women opportunities to be leaders, to build self-esteem and contacts that served us in later life,” she said. Despite her varied sports career, Romey confessed she never did realize a childhood goal: becoming a speed skater and competing in the Olympic Games. She still talks about that, but not much because she has so many fond memories of her athletic and teaching careers. Romatowski is only the fifth female elected into the National Polish-American Sports Hall of Fame. The others are Olympic track star Stella Walsh (1974), bowler Ann Setlock (1983), Olympic figure skater Janet Lynn (1980) and basketball star Carol Blazejowski (1994). Since retirement, Romey has lived in Palm Harbor, Florida. It wasn’t long after Jenny Romatowski retired and moved to Florida that she unretired and found a new and exciting athletic endeavor – breeding and raising greyhound dogs for racing. The sport is big in Florida with race tracks in most areas and in nearby Alabama. Romatowski is active in the National Greyhound Association and has owned as many as seven dogs at one time. When she’s not busy with her dogs, the spry Romatowski can be found on the golf course, volunteering at charitable events or signing autographs at baseball card shows.